Diana Darby’s latest album, the Magdalene Laundries, is inspired by the Irish social institution of the same name, which is in the long tradition of the Medicant movement founded by Francis of Assisi. In the Laundries women are sentenced to a life of slavery under the supervision of nuns; forced to work six days a week in the laundry of the Church, in an attempt to wash away their sins. The album was recorded and mixed on a 4 track device in Darby’s home, which upon its demise, was the impetus to end the album. 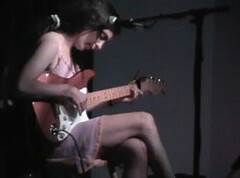 Diana sings in hushed tones, lost among the strings and strums of a muted electric guitar. The opening ballad, The Magdalene Laundries, sets the stage. It is a voice we all recognize, the plaintive tones of someone whose soul is naked before god. Pretty Flowers is a lullaby to the women, with their cracked and bleeding hands, calloused elbows dripping soapy water, to give them succor through their long, bitter meditation on the nature of virtue. A black swan appears in the fourth track, lovely, lonely and terrified that someone will come to her small pool and see just that. the hour when the ship comes in. . .